The Culinary Arts program at North Paulding High School is curriculum designed by the Georgia Department of Education and is based on American Culinary Federation Standards. The curriculum has articulations with Technical Colleges in Georgia, as well as many of the finest Culinary Arts schools in the nation. Three courses are offered in sequence: Introduction to Culinary Arts; Culinary I; and Culinary II. The Introduction to Culinary Arts course introduces students to fundamental preparation terms, concepts, and methods in Culinary Arts where laboratory practice parallels class work. The emphasis is on basic kitchen and dining room safety, sanitation, equipment maintenance and operation procedures. The course also provides an overview of the professionalism in the industry and career opportunities leading into a career pathway in Culinary Arts. The courses Culinary I and Culinary II build on the techniques and skills learned in the Introductory course as students begin to gain in-depth knowledge and hands on skill mastery. 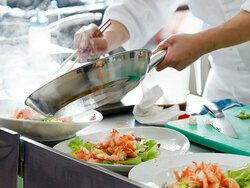 Strong importance is given to refining hands-on production of the classic fundamentals in the commercial kitchen. Jean Fierro-McCarthy, Ed.S., has been a teacher with the Paulding County School District since 2007. Prior to her teaching career she spent nearly 20 years as a meeting and event planner in Boston, Massachusetts. Chef McCarthy holds a degree in Culinary Arts, and Masters and Specialist degrees in Educational Technology. She is currently a Doctoral candidate in Workforce Education at the University of Georgia. Chef McCarthy is married and resides in Paulding County. She has three children, a grandchild, and an assortment of furbabies. Dorota Klos-Rzucidlo, MS, has many years of experience in Food Service working with the Clarke and Oconee Counties School Nutrition Programs. Chef Rzucidlo holds a Master of Science in Food Science and Technology. She completed a dietetic internship with the State University of New York College of Oneonta. Additionally, she completed the Culinary I and II summer programs at Georgia Southern University. Chef Rzucidlo is married and resides in Clarke County, GA. She has two daughters, a grandchild, and a dog named Odie. ​We are excited to welcome her to North Paulding High School's Culinary Arts Program!